I reassigned chores last week. Liberty got the newly-created job to make lunch. Every day we scramble, eat random, and make more messes than any nine people ought to be able to create during one meal. It’s a free for all of huge proportions. Now, Liberty took it over. She has plans. Organized is her middle name. She made soup and garlic bread and it was fabulous. Clean up was faster. I don’t know why it took me 15 years to think of this. I took away Stellan’s pacifier. He’s handling it better than I expected. He still gets it in bed, and other than a momentary break down when he had to put it in his bed after his nap, he has just gone with it. I’m surprised, since he had it in his mouth about 23½ hours a day up to now. My baby is growing up. Stellan can’t figure out how to walk in grass and typically chooses not to crawl in it, but today he crawled all the way across the grass to get to the pile of gravel I cleaned from the flower beds and hadn’t spread on the driveway yet. 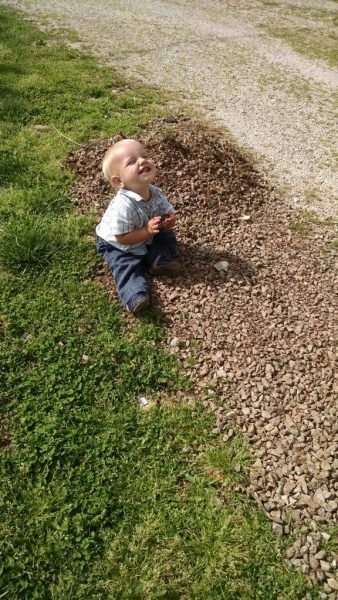 He loves dirt. Such the boy. And… We doubled our pet population. Brothers Bean and Totoro moved in last week. They are Lionhead rabbits. The kids are over the moon. Why my dishpan got donated to the care and keeping of Bean and Ro… No one’s talking. Sounds like a good plan to have the oldest fixing lunch. How nice to have an organized teen. Stellan seems to be doing pretty good without the paci. Yep, your baby is growing up too fast. Oh boy, those rabbits will keep them “hopping.” Ha!! Won’t they?! 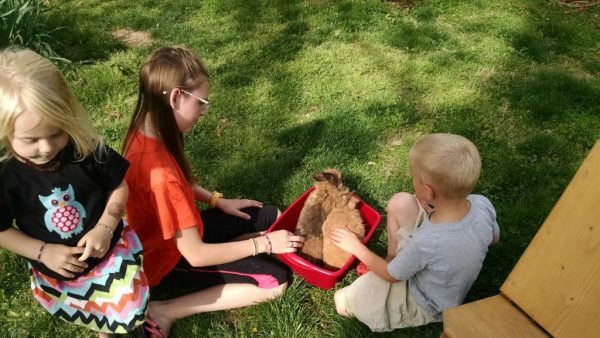 A few chores to care for animals are good for them. My garden might be better for the fertilizer too! Lol!! I was just thinking about the fate of your last rabbit the other day! Hope these do better! Do you know how many people told me their rabbits met similar fates?! It’s apparently pretty common. So sad. These came with a sturdy hutch with three latches. Hopefully that helps! Great ideas. How often do you swap their chores over? What else can Liberty cook? It’s such a great skill for her to have. I remember you mentioning checking out 80 library books, maybe she cpuld get some recipes from them! I know everything is online these days but I just adore cook books. They are so great when you don’t have any idea what to make. We switch every year it seems, maybe sooner if things aren’t working well. Liberty can cook anything with a recipe. She’s so capable! I have a shelf full of cookbooks, she uses the internet some, and we’ve borrowed many from the library. There’s nothing like flipping through a cookbook to get ideas! I would love to see her food sometime! I have a few cook books like a Star Wars one and a Manga cookbook and a lot of recipes cut from magazines.